In general, oil spills can affect animals and plants in two ways: from the oil itself and from the response or cleanup operations. Understanding both types of impacts can help spill responders minimize overall impacts to ecological communities and help them to recover much more quickly. Spilled oil can harm living things because its chemical constituents are poisonous. This can affect organisms both from internal exposure to oil through ingestion or inhalation and from external exposure through skin and eye irritation. Oil can also smother some small species of fish or invertebrates and coat feathers and fur, reducing birds' and mammals' ability to maintain their body temperatures. We have a series of guidance documents that describe the biology of and impacts of oil on sea turtles, mangroves, and coral reefs. Each one includes related planning and response considerations for oil spills which may affect these particularly sensitive organisms and habitats. What Creatures Are Most Affected by Oil Spills? Since most oils float, the creatures most affected by oil are animals like sea otters and seabirds that are found on the sea surface or on shorelines if the oil comes ashore. 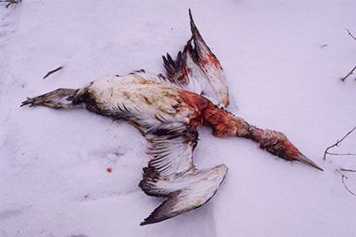 During most oil spills, seabirds are harmed and killed in greater numbers than other kinds of creatures. Sea otters can easily be harmed by oil, since their ability to stay warm depends on their fur remaining clean. If oil remains on a beach for a while, other creatures, such as snails, clams, and terrestrial animals may suffer. To learn more details about this topic, check out the Oiled Wildlife Care Network from the University of California at Davis. What Measures Are Taken When an Animal Comes in Contact with Oil? Most states have regulations about the specific procedures to follow. Untrained people should not try to capture any oiled bird or animal. At most U.S. spills, a bird and/or mammal rehabilitation center is set up to care for oiled animals. You can read an overview of this topic at EPA's Rescuing Wildlife page and find more information at the Tri-State Bird Rescue and Research website and the Oiled Wildlife Care Network website. You can also read about one NOAA staffer who usually works behind the scenes volunteering to wash birds affected by an oil spill in her city. What Type of Spilled Oil Causes the Most Harm? The type of oil spilled matters because different types of oil behave differently in the environment, and animals and birds are affected differently by different types of oil. However, it's not so easy to say which kind is worst. First, we should distinguish between "light" and "heavy" oils. Fuel oils, such as gasoline and diesel fuel, are very "light" oils. Light oils are very volatile (they evaporate relatively quickly), so they usually don't remain for long in the aquatic or marine environment (typically no longer than a few days). If they spread out on the water, as they do when they are accidentally spilled, they will evaporate relatively quickly. However, while they are present, light oils present two significant hazards. First, some can ignite or explode. Second, many light oils, such as gasoline and diesel, are also considered to be toxic. They can kill animals or plants that they touch, and they also are dangerous to humans who breathe their fumes or get them on their skin. In contrast, very "heavy" oils (like bunker oils, which are used to fuel ships) look black and may be sticky for a time until they weather sufficiently, but even then they can persist in the environment for months or even years if not removed. While these oils can be very persistent, they are generally significantly less acutely toxic than lighter oils. Instead, the short-term threat from heavy oils comes from their ability to smother organisms whereas over the long-term, some chronic health effects like tumors may result in some organisms. Also, if heavy oils get onto the feathers of birds, the birds may die of hypothermia (they lose the ability to keep themselves warm). We observe this same effect if sea otters become oiled. After days or weeks, some heavy oils will harden, becoming very similar to an asphalt road surface. In this hardened state, heavy oils will probably not harm animals or plants that come in contact with them. In between light and heavy oils are many different kinds of medium oils, which will last for some amount of time in the environment and will have different degrees of toxicity. Ultimately, the effects of any oil depend on where it is spilled, where it goes, and what animals and plants, or people, it affects.